Credible reports are surfacing of plans to reverse the flow of the 50+ year old pipeline that carries crude oil from Portland to Montreal to accommodate getting to market Alberta Tar Sands oil, or “Dilbit,” the heated, high-pressure slurry of bitumen (tar) and the chemical diluents used to liquify the tar. Permits are being sought in Canada to implement reverse flows of parts of the pipeline system connecting Alberta processors to the eastern pipeline system. This is not your conventional crude by nearly any measure you can use to describe crude oil. The methods of extraction, the processing, the dilution, the means of transportation, its characteristics when spilled, the costs of clean up… none of it follows the game plan of extracting, processing, or cleaning up spills of conventional crude. 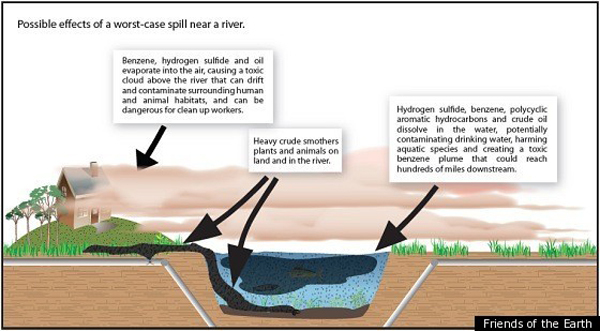 The following article appeared in a British Columbia online journal, The Tyee, on March 5, 2012 and describes the aftermath of a major spill of 843,000 gals of dilbit into the Kalamazoo River in Michigan in July of 2010. Typical costs of crude cleanup per liter run about $18.95. This clean up has so far cost tens times that amount, is months past the predicted schedule of clean up, and is nowhere near finished. I’ll let the author, Mitchell Anderson, give you the details of what a major spill of dilbit looks and smells like, but the parallels to concerns with shipping tar sands oil out of Vancouver, B.C. to shipping dilbit out of Portland Harbor should not be ignored. Poisoned air. Sunken gunk. A clean-up nightmare. What we’re learning from the oil sands ‘DilBit’ dump into the Kalamazoo River. On a July morning in 2010 in rural Michigan, a 30-inch pipeline owned by Calgary-based Enbridge Energy Partners burst and disgorged an estimated 843,000 gallons of thick crude into a tributary of the Kalamazoo River. This was no ordinary crude — it was the first ever major spill into water of diluted bitumen from the Alberta oil sands. The cleanup challenges and health impacts around Kalamazoo were unlike anything the U.S. Environmental Protection Agency had ever dealt with, and raise serious questions about the preparedness in British Columbia to respond to such a disaster on the B.C. coast — or the Vancouver harbour. Tankers exiting Vancouver harbor must transit through the shallow Second Narrows channel during “high slack water” — a short tidal window of about 20 minutes that provides loaded tankers with less than two metres of under-keel clearance. Citizens concerned about these shipments have been assured that extensive preparations have been made to respond to an accident, and that an array of skimmers and floating oil booms are on-hand to contain any spilled oil. But what if the “oil” in these tankers doesn’t float? “This was the first time the EPA or anyone has done a submerged cleanup of this magnitude,” Ralph Dollhopf, the EPA Incident Commander for the Kalamazoo spill told the local media. In the absence of any previous experience in dealing with spilled Alberta bitumen, the EPA had to “write the book” on figuring out how to recover large amounts of oil that doesn’t float. Additional questions have been raised about the volume of oil discharged by the broken Enbridge pipeline. To date, the EPA reports recovering 1,146,803 gallons of oil — 35 per cent more than the volume Enbridge reported was spilled. The EPA declined to comment on this discrepancy or on the proportion of the spill that sank, citing disclosure concerns around an ongoing investigation. The EPA also declined to estimate the proportion of oil that has so far been recovered. As the lighter portions of the spill begin to evaporate, the progressively heavier bitumen would likely begin to sink — rendering useless the conventional clean-up equipment designed to recover floating oil. Carried within the water column, accumulating on the ocean bottom or becoming entrained in marine sediments — a spill of Alberta bitumen might prove impossible to contain. What does that mean for public safety and the environment? Competent individuals and sophisticated equipment are on standby to respond to a conventional oil spill. Yet these preparations may prove to be a Maginot Line of defence should “unconventional crude” ever be spilled off the B.C. coast. This VOXEU article discusses the politics that arise in the aftermath of financial crises on a broader scale, not just our current one. I might disagree with the authors that the Occupy movement is primarily a “leftist” movement, but the overwhelming weight of this analysis that the politics of the extremes are at play here is difficult to dismiss. With the dominant culture favoring the corporatist alignments of corporation, wealth, and the elite political class the extreme politics prolonging the current Lesser Depression, as Paul Krugman describes our present economic status, can be best described as that which favors inequality at the expense of the vast majority of the public in the world’s nations today. Austerity in Europe is pushing the EU into a recession, and while the Federal government in the US has largely avoided the drastic austerity crippling Britain, Spain, Ireland, Portugal, and Greece states and local municipalities in the US are being forced into austere budget cuts that defy logic, are counter-productive to growth, largely rooted in extreme political economics espoused by both parties that for the past 40 years has helped create the difficulties and inequality we are now experiencing. A new posting to the Video page, Dirty Oil, is the story of the Alberta, Canada tar sands project, currently the largest industrial project on the planet, strip-mining boreal forest for bitumen at an unprecedented scale. An area the size of Florida holds what is being advertised as the world’s largest potential oil reserve. This land area will potentially be clear cut, the top soil removed, the bitumen (oil sands) extracted by strip mining techniques, the oil extracted from the sands emitting three times the CO2 into the atmosphere as conventional oil extraction, requiring many barrels of water per one barrel of oil to harvest the crude. The title of the film, Dirty Oil, understates the problem. The Canadian government stands to make $70 bil by 2020, the Province of Alberta about $40 bil. Dirty Oil, and a companion film, H2Oil, tell the story of this gargantuan project, the people directly affected, the costs to our global environment, the lax regulation, dishonesty, professional assassinations occurring along the way. Check out the new video page for links to some thought provoking films and lectures.